PINOY PHILOSOPHY – Thought-provoking, eye-opener articles for our awareness. Out of curiosity, I had watched a Catholic mass through a live streaming recently. But this mass is not your typical kind of mass. The venue was in a first-class indoor arena. The male guest speaker narrated a bible verse that tells a story about a biblical figure who had offered oil and flowers to the Lord. At the time I had heard that, I’m not sure what he was talking about, I was like, “who would bring their own oils and flowers in a mass?” Or maybe I was wrong — I guess this is some part of their “religious protocol”. But when the crowd still gone silent, and the guest speaker “felt” that no one bring their own stuff, the guest speaker asked in confusion, “walang nagdala?”* Then he proceeds on blaming someone: “hindi ba na-announce na magdala sila?”** He obviously had a long sigh, “acting” like he was frustrated. *No one brings [oils and flowers]? **No one announced that they need to bring? After “contemplating” for a while, he had eureka! “I got a better idea!,” he said, “how about getting our wallet out?” So he pulled his wallet out of his pocket, hold it high, waved it in the air so the attendees will see. Upon hearing that, I know already where this is going. “O-oh,” I said to myself — and I was right — he even pulled out a checkbook out of his pocket! As if that he has that checkbook along with him all of the time in his pocket! I guess he was prepared enough. There is nothing wrong about being generous. Nothing is wrong in giving. I believe in giving. The more you give, the more you will receive. I believe that the mass had its own good intentions on helping people help themselves. Have we ever wondered why there are so many religions in this world? Let’s say on Christianity alone — why there are so many Christian denominations out there, e.g. Catholic, Born Again, Baptist, some sects, some fellowship, Protestant, etc. Did we ever wondered why there so many of them? Well, I am not an atheist anymore, so I had forgotten that philosophy. But after watching that kind of “stunt” through my own eyes, it makes me think of that quote again. Ok, let’s get into the topic, but before that, I have to give a full disclosure, because you might get “shocked” on what is written on the proceeding argument. Full disclosure: No one commissioned me to write what I write. If you asked me what my current religion is, yes, I am a Catholic (by default), and yes, you can call me a hypocrite for “believing” in contrast to its practice. I’m not claiming to be a pastor, in fact, I never dreamed of becoming one. Let’s be aware, and seek truth on what the Bible says. (Oh no, the Bible again?) Relax, this is not some kind of other preaching stuff that are typically out there! I’m not trying to convert anyone of you into something. At the end of the day, people will believe in what they wanted to believe. It’s your choice by the way. All I wanted is for us to look through another “lens.” Let us not be blind! As I said, I’m an atheist before, but at that time, I believe that I know more of the Bible than those who are practicing faith to get by. What I’m trying to say is, is it more of a good practice to know what we believe in? This is a picture that I made for a quick preface on what we are going to discuss. Q: Why does it happen that there are many kinds of Christian denominations out there? A: Because “some” build a religion with its main goal is profit. As far as I know, profits that are make from religion are tax-exempt here in the Philippines. For our information, this kind of doing has been foretold in the Bible. See? This is the apostles saying, that they are unlike MANY who preach the Word of God with the intention of having PROFIT. *Translation: I will sell postcards or T – shirt that had printed the word of God. 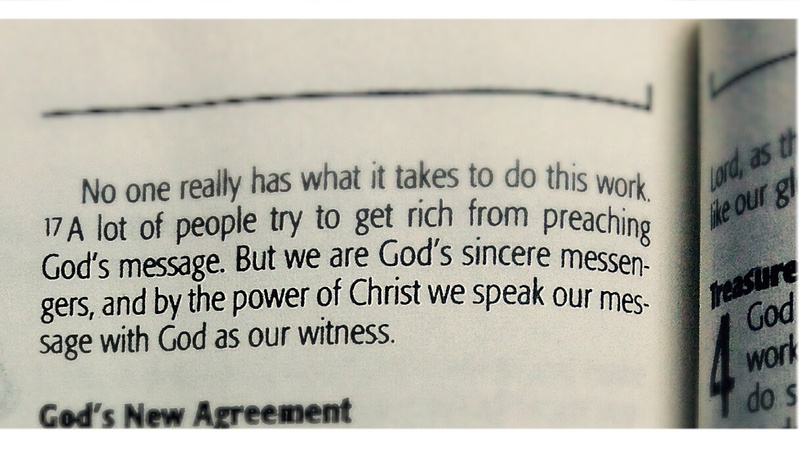 As if we should have paid the word of God . I will monetize using the word of God. Hahaha! Is that right to do so? Or, I will do what pastors do. I will accept prayer requests, in the bus, and of course, they are required to pay! If the pay will be in high amount, the request will be quickly granted. I will say I have a high praying aptitude if I can get paid high. Hahaha. But they should not realize that paid prayers are worthless! And realize that God does no business by proxy. Haha. When we pray, we can go straight to Him, right? The example above had reflected a way on how a certain religious group will earn. They sell merchandise using the Word of God. You can see it everywhere. People selling books, (even e-books on Play Store and Apple App store), images, rosaries, prayer requests, to baptismal fees, wedding fees, etc. They can earn a multiple ways if one is so inclined. But there is another way for a religion to earn more exponentially than this. It is through tithes. The popular and debatable tithes. 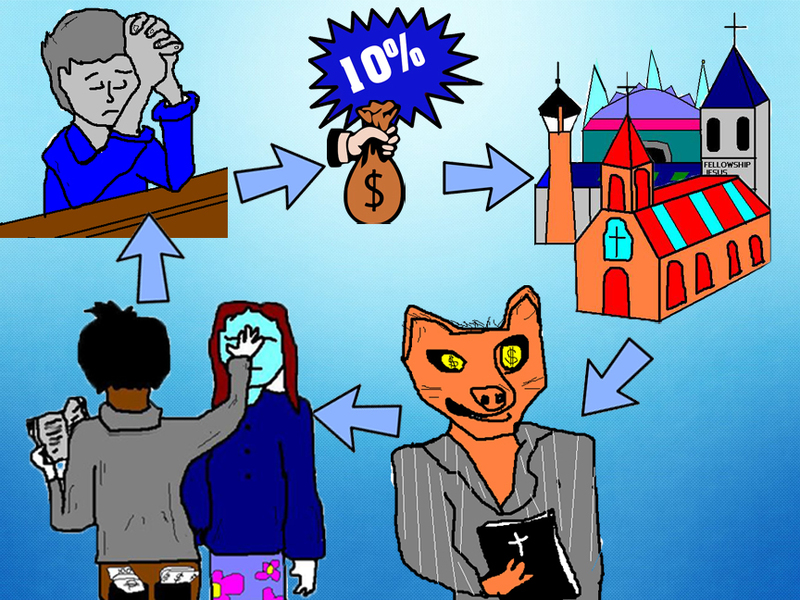 Giving your tenth (10%) of your income are required in most religious sects. Yes, tithes, are mentioned in the Bible. But these laws are obsolete, as reflected right after seven verses from that line. The former Levi priesthood was changed when Jesus Christ came. So then, what is the new law? You know the popular saying “God loves a cheerful giver?” That supersedes the “tithing” law. Of course, it is also found in the Bible. But first, let’s complete that verse. The keyword here is the word “compulsion.” Compulsion is the state of being forced to do something. Tithes are an essential requirement for some religion. A requirement is something that you are forced to do. Then, tithes forced you to pay for something! Isn’t it tithing and “giving NOT under compulsion” are concepts that are contrasting? To put it simply, God doesn’t want us to give because we feel we must. God teaches us the values of giving, as long as we are happy with it, as long as our heart is willing to give — even it is less or more than 10% of your income. But whenever a church required tithes, you give money because you are forced into it. It invalidates the preceding Bible verse. We can say tithes is used for the operational expenses of the church. Yes, actually, it is! It is used to pay the rent of a certain big venue. It doesn’t matter anyway, whether your money came from good or “evil” to those people who preach the Word of God just for the sake of having a profit! But, as you will become more aware and think — does God need your money? God does not want your money! Actually, he does not need money. Right? You know what God wants? What God appreciates? God wants your time, share your love to others, and — this is the hardest part for the others — follow what it is written in the Bible, no more and no less. Now if the money will be used in some form of charity, medical missions, and to help those who are needy, that’s good! It is the sacred use of money, as long as this money came from “good” ways. Whenever by this means will be used to help our brother, you do it to God. Remember the Golden Rule, right? Q: How to detect a false prophet? A: A false prophet is teaching what is not written in the Bible, or paraphrasing what is in the Bible, or “interpreting” what is in the Bible for their own interest, saying some invalid ideals. I heard someone say, “. . . it was written 3000 years ago and so that Bible line is not relevant anymore!” How can you somebody say that? Then don’t use the Bible at all! It is not relevant naman pala! But when it comes to tithing law, all are relevant. How come? Another disclosure: You can say, I might be the one who is “interpreting”; but hey, for the record, at least I am not using the Word of God through this blog just to “manipulate” others so I can have PROFIT! Then, why many people believed with some “manipulative” religion and its false prophet? You can answer it if you looked at my drawing again. You might be familiar if you ever watched a preacher claimed to heal a certain sick person on stage, just by putting his hand on the forehead of the sick person, citing “exorcism” prayers, then boom! The sick person collapses and everybody applauses, claiming that the person is now healed! Do we know that not all miracles are from God? See? Not all miracles are from the will of God! We have to watch out! But how do false prophets “market” themselves that they can perform miracles? 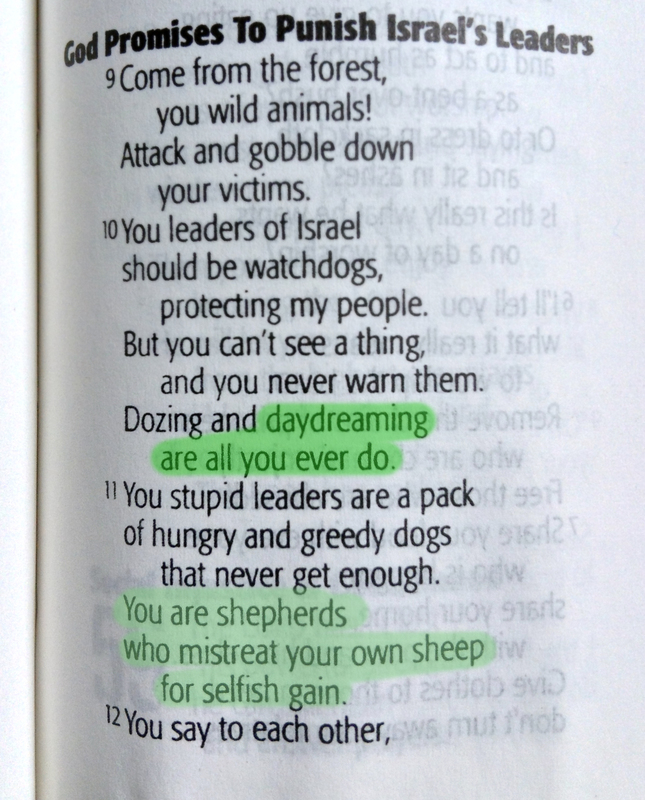 Many false prophets will say something like they had encountered God through a dream, or they have a “vision.” In that way everyone will believe what the false prophet might say. They claimed he or she had a conversation with God. Nah! 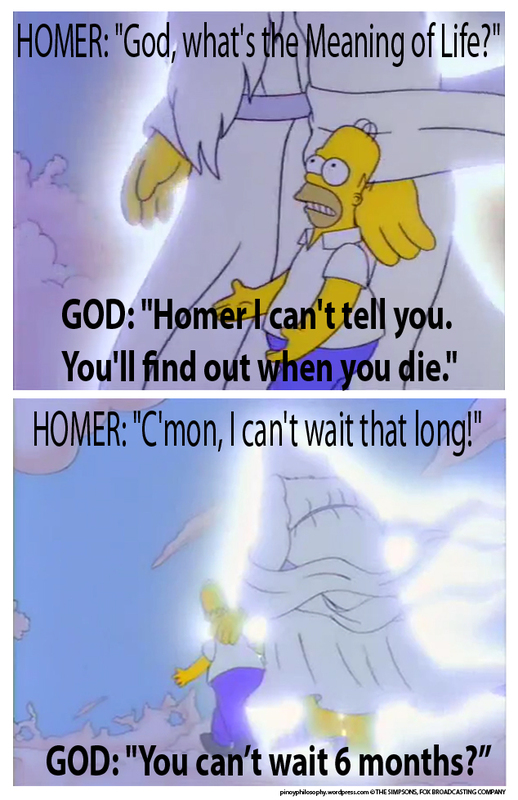 Even Homer J. Simpson can say that! And also, false prophets are very positive people. They instill hope to the people. There is nothing wrong to be positive and give hope to the people, because some people don’t know that they still have that hope. But again, if they used this style to “market” and draw people to them so they can eventually ask for tithes for personal interests such as profit, there is something “fishy” in these. See? Is this what we called the Law of Attraction? Or a technique used by a false prophet to “attract” people? The false prophet knows people are always motivated by money, in fact, they know it because they can relate themselves into it. I’m not saying money is not essential. In fact, there is a Bible verse that state that money is essential. NO ONE CAN SERVE TWO MASTERS… YOU CANNOT SERVE BOTH GOD AND MONEY. Especially when your PASSION is teaching the word of GOD, please, DO NOT TURN IT INTO PROFIT! Don’t turn this passion into profit! Did the apostles do their “work” for the sake of having profit? Neither did Jesus, who died poor on the cross. But why many people become “obsessed” with some “manipulative” religion and its false prophet? This is what I think the world gets wrong. Many people think that doing the conventional things wherein most people follow and do is always the right thing to do. Remember, not because many people “do” it, doesn’t make it right. So you cannot just simply say that because you have many members, it means that you are on the right side. Many people will go to malls than those who go to church. Many people spend time on playing online games, browsing their Facebook and on some internet stuff rather than reading something very useful. Ok, I’m sorry, if this blog is somehow too long. I believe in God and especially the teachings in the Bible (no more, no less, no interpreting for their own sake, no paraphrasing). For in these writings, we can seek the truth, and we can be guided on how to live a better way of life. (But not in “some” religion.) Ever since, I was “shopping” for a religion that speaks about the TRUTH. You can call me confused. Yes. But I had the Bible as a basis. Maybe I will build my own religion. I know I am not perfect, but at least, I believe, I’m not a follower of something that is false. And I hate to see someone else became blind because some blind leads them. Hence the saying, “the blind leading the blind.” (Matthew 15:13-14). Or you can say I am the one who is blind, or I am a false prophet. P.S. 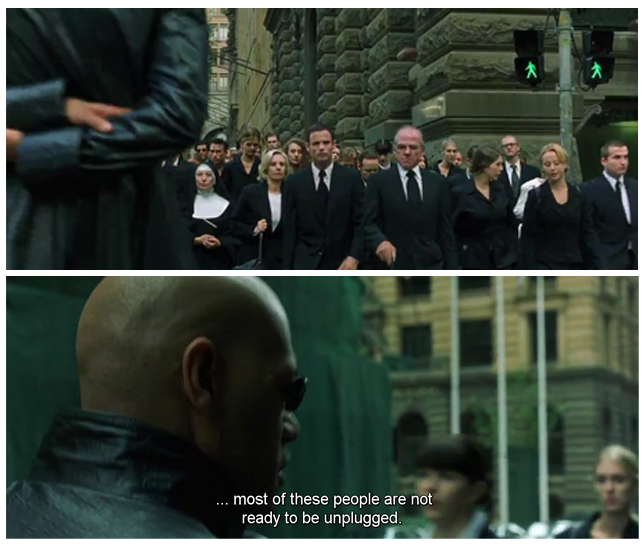 If you had watched the film The Matrix, and decoded its Christian allegory theme, you know what I mean. Most people are not ready to be “unplugged”, they go on with their everyday lives, without seeking the truth. They said that we have to be always happy. But this is some kind of a “dumb” thing, like suffering is no part of life. What? Suffering is essential in this world, so every victory will be “sweet” if we overcome suffering. Look at Jesus who died for all of us. Did He not suffer at the time of his crucifixion? I will explain these to my next blog. Ang kulit mo ha! Bobo ba ang Diyos? Naalala ko ang napanood ko dati sa Wowowee, ang istorya ni Roni Cordero, isang simpleng husband. Ang kulit kasi ng asawa niya. Ilang ulit kasi siyang itinatanong ng misis niya ng “mahal mo ba ako?” E dumating sa punto na nakukulitan na siya sa tuwing ang misis niya ay nagtatanong. Ang resulta, nagsulat siya ng kanta, at pinamagatan niya itong “Hanggang”, na ikinanta ni Wency Cornejo. Malinaw na malinaw sa unang linya pa lang ng kanta, “Ilan ulit mo ng itinatanong sa kin. . .” , at doon na natapos ang pangungulit ng kaniyang misis. Pakiramdam niya kasi nagdududa ang misis niya sa pagmamahal niya sa tuwing tatanungin siya ng ganon. Ganun din ang Diyos, ayaw niya na inuulit-ulit ang dasal. Sabi, huwag ulit-ulitin ang dasal! Bakit? Diba kaya nga tayo ng fa-follow up sa isang bagay ay dahil wala tayong tiwala? Walang trust. Walang faith! Sa tingin mo, baka kasi nakalimutan na ang bagay na iyong hinihiling, at gusto mo itong ipaalala, kaya inuulit mo. Diba ganun? Isipin niyo, iyong anak niyo, lagi niyo siya pinapa-alalahanan. Araw-araw, minu-minuto. Pero imbis na maintindihan kayo ng anak niyo, imbis na sumunod siya sa iyo, nagrerebelde, lalo na pag malaki na ang anak ninyo. Bakit? Nakulitan lang sa iyo! E pinapakita mo kasi sa anak mo na wala kang tiwala sa anak mo! You are sending a “wrong signal” to your child na hindi niya magagawa ang bagay na gusto mo, at naiisip ng anak mo, kaya paulit-ulit, dahil bobo siya. Kung may tiwala ka naman sa anak mo na magaling siya at matalino, hindi mo na kailangan ipa-alalahanan ang anak mo, diba? Isipin mo iyong empleyado mo, pag lagi mong pinapa-alalahanan, e minamasama niya ito. Bakit? Pero pag nagdadasal na, hindi na tao ang kausap mo, kundi mas mataas pa sa tao. Diyos na ang kausap mo! At hindi bobo ang Diyos! Sa katunayan, alam niya na ang bagay na ihihiling mo, bago mo pa hilingin! Kita mo na? E bakit pag nagrorosaryo, paulit ulit ang dasal? Posted on March 31, 2015 Categories Pinoy traits on religionTags bible, Chrisitianity, holy week, Jesus, Manila, philippines, pinoy, pinoy philosophy, roman catholic, rosary16 Comments on Ang kulit mo ha! Bobo ba ang Diyos? Datihan na empleyado: mababa sahod. Bagong empleyado: mas mataas sahod? Naalala ko yung mga dating kasamahan ko sa trabaho, na kahit sila pa ang nauna sa kumpanya, they felt underpaid, lalo na pag ikinumpara nila ang sarili nila sa mga mas bagong empleyado. In other words, kung sino pa ang mas matagal na nagtatrabaho sa isang certain na kumpanya, kung sino pa ang naka-ilang taon na sa kumpanya – sila pa ang may mababang sahod, at hindi man lang na increasan. Samantalang yung bagong hired, as in kaka-hired lang, ay may mas mataas pa na sahod compared sa mga nauna nang empleyado. Pareho lang naman na posisyon. Ang daya noh? And I “feel” for them sa mga dati kong kasamahan. To be honest, naiinis ako sa employer namin noon kasi nga para sa akin ay may “napatunayan” naman na yung mga dati kong kasamahan, at hindi makatarungan na kung sino pa ang bago, siya pa ang may mataas na sahod. At para sa karamihan, ang sahod nga naman ay parang indicator ng iyong importansya sa iyong kumpanya. Kung mas mataas ang sahod mo sa iba, pakiramdam natin ay mas nakakataas, mas magaling, at mas importante tayo kaysa sa ibang co-worker mo na kapareho lang ng iyong posisyon. Kaya sabi ng employer na hindi dapat nagpapakitaan ng payslip ang mga empleyado sa isa’t isa, kasi magdudulot lang ito ng inggitan. So ano ang point kung bakit ko ito nakwento? Nakalagay rin pala ang ganitong sitwasyon sa Bibliya. Ngayon ko lang din nalaman. Early one morning a man went out to hire some workers for his vineyard. After he had agreed to pay them the usual amount for a day’s work, he sent them off to his vineyard. About nine that morning, the man saw some other people standing in the market with nothing to do. He said he would pay them what was fair, if they would work in his vineyard. So they went. That evening the owner of the vineyard told the man in charge of the workers to call them in and give them their money. He also told the man to begin with the ones who were hired last. When the workers arrived, the ones who had been hired at five in the afternoon were given a full day’s pay. Oh no! Kuhang kuha noh? Paano na kaya kung nakuha nila magreklamo mismo dun sa employer at ipapabasa sa kanila ang Bible verses na ito. Mabu-boom panes siguro sila. Huhu. Kahit mahirap tanggapin, oo nga naman, wala na tayo doon, kasi pera na ng employer ang pinag-uusapan, at gagawin niya kung ano ang sakaling gustuhin niya sa pera niya. Matutuwa siguro sa akin ang mga employer at maaasar ang mga empleyado. Sa mga empleyado, pag-isipan na lang natin kung paano tayo makakakuha ng increase at makakakuha ng magandang recognition. Iwasan natin maging mareklamo at mainggit sa kapwa empleyado, wag manira ng iba, at wag ma-involved sa politko. Pakialamanan mo muna ang sarili mo, at huwag ang iba! Maging positibo pa rin ang maganda mong gawin. Sa totoo lang dapat mo nga itong pasalamatan na underpaid ka. Uulitin ko, pasalamat ka at nafi-feel mo na underpaid ka – kasi mas magiging creative ka at makakagawa ka ng ibang paraan upang kumita ng pera. Madalas, yung sideline mo pa ang ikayayaman mo. Unlike sa mga nasa corpo at may mataas ng sahod, minsan kontento na sila. The point is: Ang kagandahan sa Bibliya ay ilang taon nang nakalipas isinulat ang mga salita na narito, pero relevant pa rin sa lahat ang mga salitang nakasulat dito ngayon. Sinabi ito ng Diyos para iwas inggitan na lang – at walang first come, first serve sa langit. Posted on March 24, 2015 March 24, 2015 Categories Pinoy traits on societyTags bible, Christianity, empleyado, employment, employment philippines, Filipino, mababa sahod, Manila, Matthew 20, philippines, pinoy7 Comments on Datihan na empleyado: mababa sahod. Bagong empleyado: mas mataas sahod? O Cellphone, paano kaya tayo mabubuhay pag wala ka diyan? 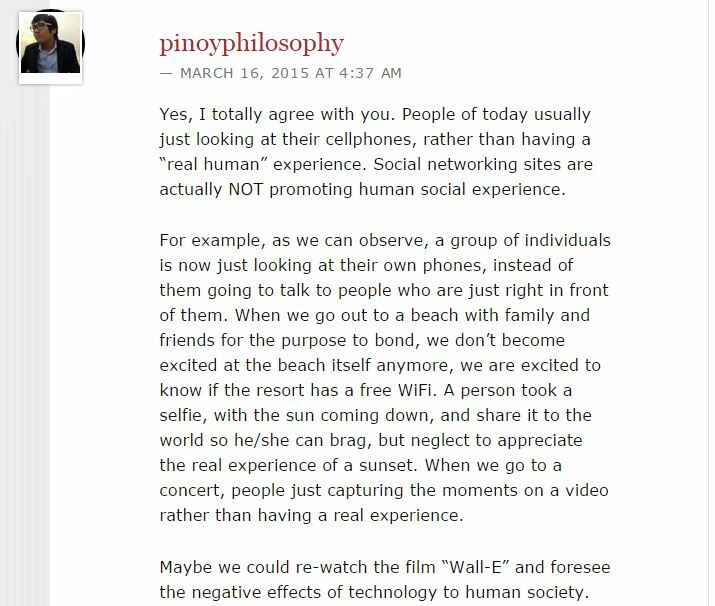 Nasabi ko sa previous blog ko na “your cellphones reflect who you are” – na marketing strategy lang iyon ng mga cellphone companies. Well, bakit nga ba nila nasabi iyon? Simple lang naman ang sagot: mas magmumukhang “mas mayaman” ka pag maganda ang phone mo. Yung iba, bibili ng latest na phone na mas mahal pa kaysa sa monthly sahod nila. Pero kung na “full potential” mo ang phone mo, sulit naman, diba? Madaming features, therefore, mas “cool” ka. Kung natatandaan ko, sabi nga sa novel ni Dan Brown na The Lost Symbol, pag gumamit daw tayo ng cellphones ay para na tayong may Godlike powers. Ayos, diba? Sa comment na ito, nabanggit ko ang napakagandang pelikula na Wall-E, dahil pinapakita sa movie na ito ang magiging posibleng negatibong epekto ng teknolohiya sa ating future. Maitatanong mo, kung nag-uumpisa na ba natin maramdaman ang destruction of our human society? Hindi ko naman itinatago na minsan gawain ko ito. At least AWARE na ko, at gusto kong i-SHARE sa inyo ang aking mga obserbasyon para maging aware din kayo. Imbis na magdasal tayo bago kumain, ngayon nakakalimutan na natin ito gawin, pero naalala natin mag take pictures na lang. Haha. Then selfie. Post sa Facebook, Instagram, Twitter, lahat lahat na! Kahit mabagal wi-fi hihintayin pa natin ma-upload. What the..? Gutom na yung kasamo mo uyy! Sa mga may-ari ng resto, ang tagal na ngayon mabakante ng isang upuan. Paano nakikigamit pa ng free wi-fi yung customers, (kahit tubig lang naman ang inorder)! Hahaha. Pati yung mga waiter, na-aabala. Imbis na kumuha ng order at magserve lang ng food ang trabaho nila, nagiging photographer na rin! Maski wala na sa EDSA at nasa work na, “nata-trapik” pa din ang waiter. Hehe. Tapos magrereklamo tayo kung bakit mabagal ang serbisyo? Nyak! Sa maling paggamit ng cellphone, pati productivity ng trabaho natin, bumabagal. I-i-style pa tayo: na kunwari seryoso sa trabaho, patadyak-tadyak pa sa mesa na akala ng iba nagkamali sa Excel o sa pag AutoCad – yun pala nagkamali lang ng moves sa Candy Crush o Clash of Clans. Naglalaro lang pala! Minsan din, seryoso ka na ngayon sa trabaho: nag-uupload ka ng files sa email, kaso ang bagal. Yun pala yung kasama mo nanonood lang sa YouTube! Haha. Hindi nga naglalaro, net naman ng net ng kung ano-ano. Wala rin! Haha. Mapa-games o mindless internet: cause of distractions. Cause of delay pa tayo sa productivity ng kumpanya mo. Dahil maliit lang ang cellphone, kaya ito dalhin sa CR. Unlike TV, o portable DVD Player. . .(o guys, you know what I mean na, hahaha) . . .para makaraos. Akala natin OK lang naman, until I found out recently, masama pala ito, kasi nalaman ko ngayon-ngayon lang na sabi sa Bibliya. Oh no… Goodbye Maria Ozawa! Maangas ka magcomment sa iba dahil hindi mo naman nakikita sa harapan mo yung “inaasar” mo e. Hindi tayo takot. Hindi naman lalabas yung kamay ng inaasar mo sa monitor mo at bigla kang sasapakin. (Ask online DOTA players na laging nagta-trashtalk, o sa ibang online games; pwede rin maski sa ibang articles at comment box.) The thing is, it promotes disharmony. Sa pampublikong sasakyan, katulad ng MRT, bus, o airplane – hindi mo na kailangan obligadong kausapin ang katabi mo pangtanggal inip. Andiyan naman ang cellphone e. Ang epekto, nawawala na ang “human interaction skills” natin. Pero don’t talk to strangers ika-nga. Hahaha. Pero lahat naman ng nakikilala natin, naging strangers din sila dati. Malay natin, yung stranger na yun ngayon, yun pala magiging asawa mo in the future. Ok lang, may online dating naman ngayon e.
Sabagay, may ibang tao na introvert. Lalo na mga long hair at rakista, o emo, mapababae o lalake – gusto nila naka-malaking headphones na parang nagsasabi, “Don’t talk to me! Can’t you see I’m listening to music?! I want to be alone!” Pero yung nasilip mo na yung device nila, playlist naman ni Sarah Geronimo yung pinapatugtog. Hahaha. (Thanks, hindi ako nag-iisa.) Pero kahit pareho pa tayong may idol kay Sarah G., at may common interest, hindi pa rin madaling magka-approachan, kasi naka-headphones nga e.
Imbis na matuto tumugtog nang totoong musical instrument, sa apps na fake drums na lang tayo tumutugtog, o piano simulation. Mas malala, sa Guitar Hero lang magaling! Justin Bieber pa ang piniling tugtog. Haha. Nakakalimutan na natin bumuklat ng libro. Yung totoong libro! Hindi e-book. Haha. Sabagay mas environmental friendly nga naman daw ang e-book, kasi hindi na gagamit ng papel, hindi na puputol ng puno. Nyak. Ang mga bata ngayon, hindi na marunong maglaro ng classic na mga laro tulad ng tumbang preso, taguan, jolens, luksong baka, patintero, at iba pa. “Boring stuff” na sa mga bagong henerasyon ngayon yun. Saka boring na rin yung kite flying, at laro na pini-pitpit yung tansan tapos bubutasan sa gitna, saka lalagyan ng sinulid at papa-ikutin. (Ano tawag sa laro na yun?) Hahaha. Salamat sa mga nagbasa (at magbabasa pa) ng aking nakaraan na article na Mga Senyales Na Ikaw Ay Mahirap. Sa lahat nang mga nagkumento, as in sa LAHAT nang mga kumento, maraming salamat po sa inyo! I agree to everyone of you, dahil nirerespeto ko ang pananaw ng bawat isa sa atin. Dahil alam ko ang pananaw ng bawat isa sa atin, ay tama para sa sarili nila. We can share our opinions, pero gaya nga ng nasabi ko, and I reiterate: RESPETUHIN na lang natin ang kumento ng isa’t isa. I didn’t mean to offend somebody. My purpose is to be an eye-opener sa mga mahihirap. When I speak of “mahirap”, it doesn’t necessarily mean na mahirap in terms of financial status. There are other forms of “riches” na mas HIGIT pa sa financial status, katulad ng kontrol sa sarili, pagkakaroon ng harmomy in all human relations, positive mental attitude, at open-mindedness sa lahat ng topic. Hindi tayo magiging harmonious sa iba kung puro negative, at kung hindi natin sisikapin na maintindihan ang iba. Ayaw natin nang gera; pero kaya nga nagkakagera, dahil sa hindi pagkaka-unawaan at closed-mindedness. Pero kung hindi maiwasan mag differ – remember: WE CAN AGREE TO DISAGREE. Pero ganyan talaga ang nature ng madaming tao. Hindi naman tayo nakikipagtalo ng physikalan katulad ng mga hayop. Hindi tayo tulad ng leon na siya na ang hari ng kagubatan dahil mas malakas siya sa usa, at dahil dun nasa itaas siya ng food chain. Sa halip, “kinakain” natin ang ibang tao sa pamamagitan ng tagisan ng talino, at pagmamayabang ng gamit at pera. Pero, ang patutungo natin sa iba ay hindi naman dapat maging competition. Sa sports pwede pa, at the end of the day, laro lang naman yun. Pero what about sa totoong buhay? Most of life is not a competition — na tipong pag nakalamang ka kumpara sa ibang tao, feeling mo, “nakain” mo na yung ibang tao. Hindi ganun. Ang TOTOONG MAYAMAN ay hindi nakikipagkumpetensya, dahil may tiwala sila sa sarili nilang kapabilidad, at hindi na nila kailangan ng approval ng iba o “kainin” pa ang iba sa argumento. Coordination. Ang TOTOONG MAYAMAN ay hindi nakikipagkumpetensya, dahil alam nilang sapat ang resources para sa lahat. Abundance. Hindi na nila kailangan “kainin” pa ang iba. Bakit pa nila kakailangananin makipagkumpetensya sa iba, kung alam nila hindi naman sila mauubusan? Instead, they CREATE, not compete. And more importantly, they truly understand other people. For the record, I was poor myself. And I experienced all of these signs, so tama ang iba, may pinaghuhugatan nga ko. Sarcastic ako sa sarili ko. Hehe. At least, ngayon, I have a “rich” mentality. It is all in the mentality. Lahat naman tayo gusto yumaman. Sa mga mahihirap, lahat gusto magbago ang buhay. Pero bakit mismo ang sarili, hindi mabago? Therefore, they remain bound. They remain poor. I wrote this so I can remind myself na umiwas sa bad traits I had been gone through, of the poor habits na napagdaanan ko. And I want to speak for the people that has that same struggle too, and wake up their minds. . .
Kahit mali-mali pa grammar ko. Basta, ang mahalaga ay ang ating personality – hindi kung paano tayo kagaling makipag-communicate, o gaano pa tayo katalino, o kung gaano pa tayo kayaman. Meron ngang iba na magaling magsalita, matalino, mayaman, nakapatapos pa ng pag-aaral, pero nanloloko naman ng kapwa, o yung classic na example: nagnakaw naman ng kaban ng bayan. Corrupt. May bilyon pero ninakaw. Mayaman nga pero nanlamang naman ng kapwa. Kaya sa huli, ang pinakamahalaga ay sinceridad pa rin ng isang tao, lalo na kung ang layunin ay para makatulong sa iba. Sa pari ba tayo nagkasalanan? Many people use the expression, “Susmaryosep.” I hate it when I hear it, even it was derived from JeSUS, MARY, and JOSEPh. Or even the expressions, “Sus, Ginoong Maria!” Or “Panginoon ko po!”, or “O Diyos ko!”, and the like. Come to think about it, where do we often use that line? Or, “Panginoon ko naman.. Patay tayo diyan,” as an expression in disbelief and awe. And more often, when we are complaining. We often not aware on what we regularly say, especially these words. They become part of our habits. And habits do not distinguish what is good and bad. The mind just unconsciously spew it, the same principle as the slip-of-the-tounge concept. As we had read this, we must be aware of our choice of words. We must guard our thoughts to these unconscious habits on bad use of expressions. Curse words. God does not want cursing, especially when we use His name against Him. Posted on March 3, 2015 March 3, 2015 Categories Pinoy traits on religionTags aba ginoong maria, bible, Christianity, panginoon ko, philippines, pinoy curse words, religion, roman catholic, susmaryosep4 Comments on Susmaryosep!